This guide will walk you through the process of minimizing SPAM and Attachment filtering that is done in the external SPAM system. Additionally, the guide will walk you through configuring the service so that SPAM is delivered to the Spam folder in your webmail client with the label "SPAM" prepended to the subject line. Further, we will set up the Spam folder to automatically delete messages 30 days after they arrive. NOTE: By performing these steps, you are setting the SPAM Quarantine service to no longer quarantine any messages, and to deliver regardless of their danger level and risk to you or your computer. You should be suspicious of every message marked as SPAM by this system and only click links, view images or open attachments from people you trust who are sending email that they would logically send. Step 3. 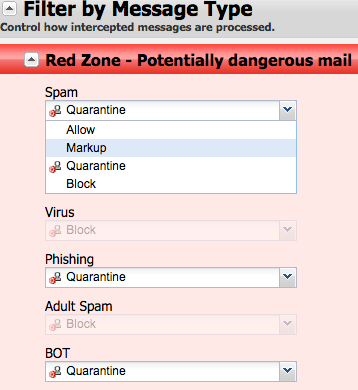 Click the down arrow next to Red Zone - Potentially dangerous mail to edit delivery options. Note - By allowing potentially dangerous email to be delivered to your mailbox you are intentionally removing a service designed to protect you from content that if opened could expose you to phishing or links to other sites that might deploy malicious code to your computer. Perform this only if you understand the risks and are willing to manage them yourself. Step 5. 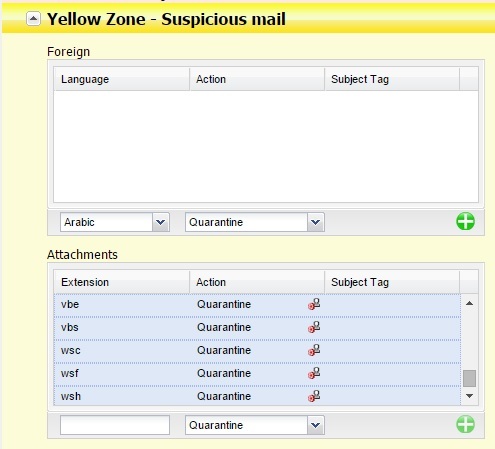 Click the down arrow next to Yellow Zone - Suspicious mail to edit delivery options. The Foreign section should be empty, but the Attachment section will have a series of extensions that are known to be suspicious. Note - Allowing suspicious attachments to be delivered to your mailbox and mail clients can expose you to malicious files that may damage your computer or assist others with stealing your information. Perform this only if you understand the risks and are willing to manage them yourself. 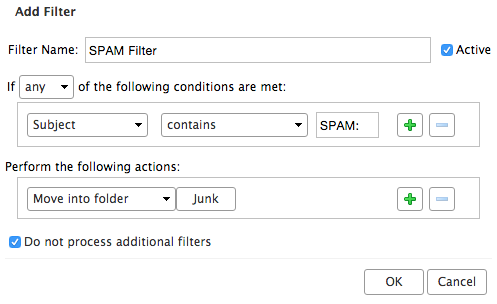 Congratulations, your Spam Filter is now set up! Greymail will no longer quarantine any further emails, and all junk, suspicious or potentially dangerous email will be delivered to your Spam folder in Zimbra.